The Dell i3542-6003BK is an affordable and a decent 15.6″ laptop in terms of price. The Intel i3 1.9 GHz processor is a hyper-threaded and dual-core that does its job fine, found no lags while browsing the internet, streaming videos from YouTube, and doing skype. 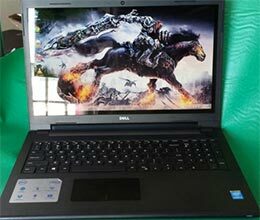 For gaming, I haven’t tested it yet, as I know it is not intended laptop to game. I reckon uninstalling pre-installed software like anti virus speed the Dell 6003BK laptop up. Compare with similar specs, in this table. It comes with 4GB of RAM, but it’s upgradeable to max 8 GB, it has bottom cover that has a screw you can open to reach the wifi stuff, hard drive and the memory of the Dell i3542-6003BK. As written above, the basic computing like web browsing, video streaming and video chat with skype can be accomplished pretty nicely with the built-in 4 GB of RAM. There is nothing fancy with this Dell appearance, but it has decent build quality. The keyboard has number pas, and it has sturdy hinges. Having the 1366 x 768 screen resolution is a little bit disappointing, this said, this laptop doesn’t have the best viewing-angles, although it is pretty ok to do my computing jobs, big plus is it is a touchscreen laptop. This Dell i3542-6003BK comes with pre-installed Windows 8.1 Operating System, which is a lot better than the previous Win 8. I am getting used to it quick. Click here if you plan to downgrade the OS, but I don’t recommend it, Windows 7 support will be stopped anytime soon. The touchscreen works just fine. So what will you get for under 400 bucks? – The newest 1.9 GHz Intel i3 dual-core processor with 04 vrtual cores. – 4GB of memory, which is expandable to 8 GB. – Thin and very ergonomic laptop and keyboard design. – 3 USB ports (2xUSB 2.0 and 1x USB 3.0), HDMI and SD Card port that will enable you connecting your laptop to a TV and connecting your camera to the laptop. For this price (got it best from here), mid range budget device, this Dell i3542-6003BK ticks everything we need. The newest i3 processor, 4GB of RAM, decent 500GB hard drive space, and the touchscreen display. The USB 3.0 port, DVD optical drive are nice bonus to have up to date laptop and won’t disappoint you for this price. Yes, you can get better laptop with more power processor like i5 or i7, and those that have Solid State Drive, but for under 400 this Dell i3542-6003BK is an excellent device.